Before scanning all the books I took photos of them on their bookshelves and had full size posters made of the images. The poster print of the shelf of Paperback books had two images of about 88 cm (37 inches) in length and roughly 24 cm (10 inches) in height (slightly more than the largest book). 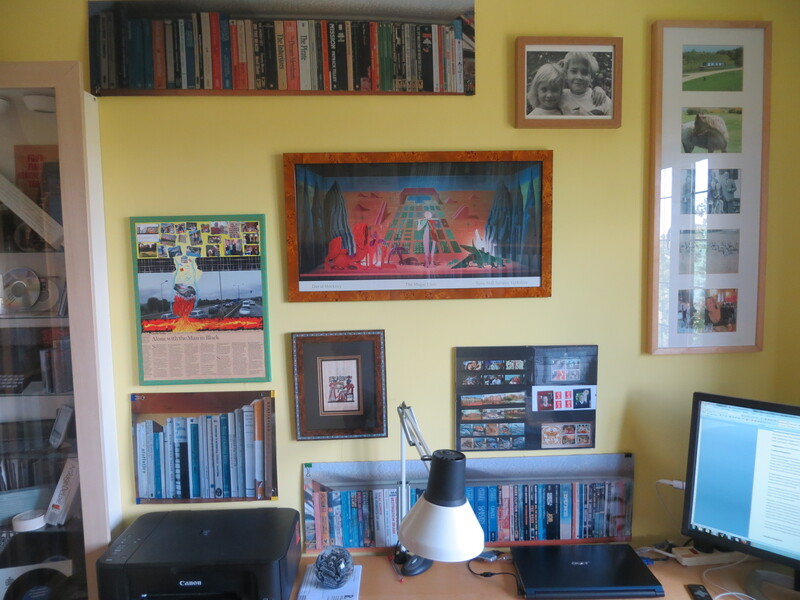 After completing the scan of the Paperbacks back in July, I cut out the two poster images, fixed them on some stiff cardboard using miniature bulldog clips and found a couple of spaces on the study wall facing my desk as shown in the image below. Having had several weeks to ponder them, I‘ve found it pleasing to have them there. I have much better visibility of these books than I had previously as I now look at them every time I sit down at my desk; and it took relatively little effort to achieve and has not taken up any valuable space other than areas of previously blank wall. Of course an electronic and customisable display of the virtual books would have been preferable – but this low-tech version serves much the same purpose. After completing the scans of the Work and University books last Sunday, I duly cut out the poster prints of those two sets of books. 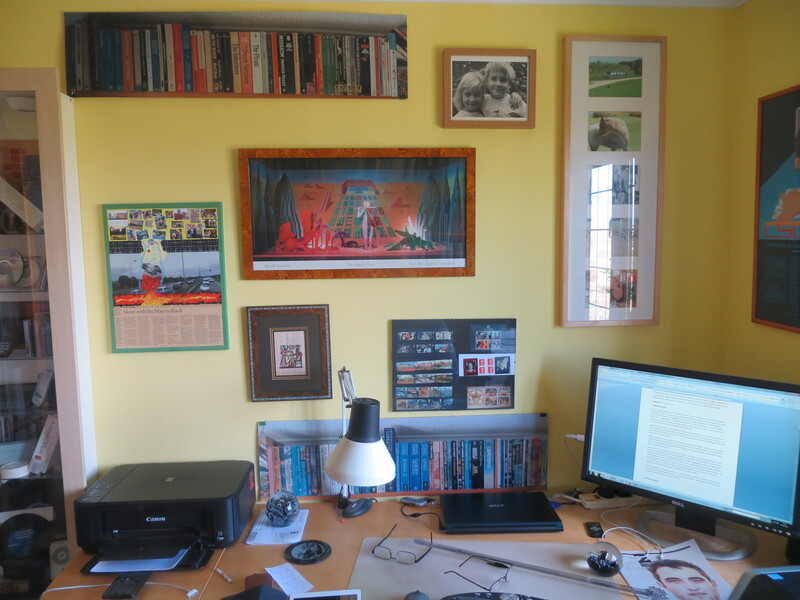 The University books poster is relatively small – some 39 x 32 cm (15.5 x 12.5 inches) and was relatively easy to fit onto the now increasingly crowded wall facing my desk – see below bottom left. However, the Work books poster, at 114 x 31 cm (47.5 x 12 inches), was far more difficult to place. I was even considering putting it on the wall behind my desk under the bookshelves – or even on the empty bookshelf where the books originally sat – until I had a lightbulb moment and realised the poster didn’t have to be horizontal. Since the titles are normally printed down the spine, they will appear horizontal – and be easier to read – when the poster is turned vertically! Obvious really – but I just hadn’t seen it up to that point. Anyway that made finding a space a whole lot easier and I finally selected a very visible spot between the window and the existing bookshelf as shown below. 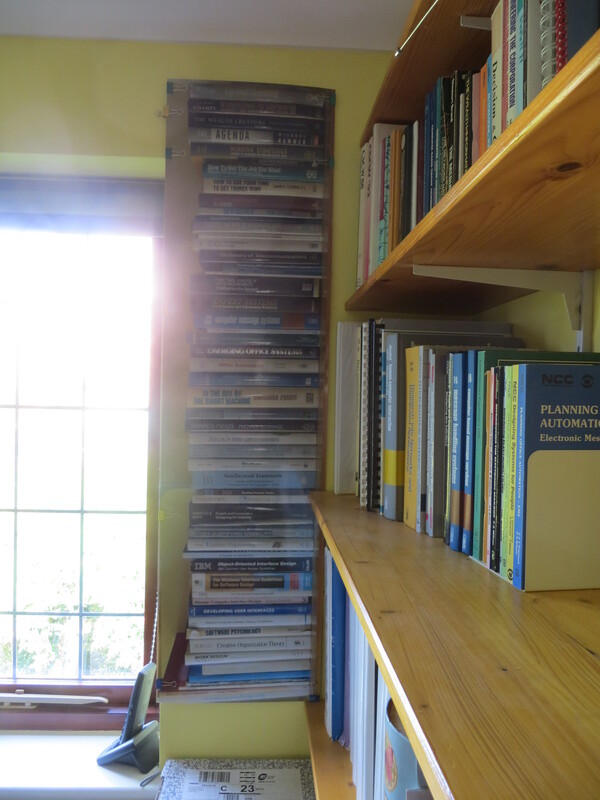 So now I still have my books around me, and I can access their contents very easily on the iPad; and I also have two empty bookshelves which I can use for other things – a welcome benefit since I have very little spare storage space left in my study.